Your smartphone has a vast amount of components inside. If one of these components isn’t working correctly, it can ruin your whole experience. But how do you pinpoint exactly what is wrong with your device? Maybe the accelerometer seems a bit off, or web browsing on mobile data or Wi-Fi feels sluggish. How about if you bought a secondhand Android device and want to check that everything works OK? Whatever the problem, there’s an app that will help you figure out what’s wrong with your Android phone. Even if you don’t have a specific problem, it’s good to run a smartphone checkup to make sure everything is ticking along nicely. Phone Check (and Test) is one of the best Android hardware checking apps you can get. The app functions somewhat like the desktop app CPU-Z, giving you a complete rundown of your phone’s hardware specifics while adding an extensive range of hardware check options. Thankfully, the app is straightforward to use. The Monitor option provides a basic overview of your current phone status, including CPU load, battery charge and overall health, and your current network connections. The Phone Check app suggests turning on Wi-Fi, Bluetooth, and NFC, making sure you have at least 30 percent battery, and conducting the test using battery power (rather than your power outlet). When you’re ready, hit the Test Phone button and watch the Android smartphone testing magic unfold. Phone Doctor Plus is like a little trip to the doctor… but for your phone. The app allows you to run through a series of system hardware checkups to ensure every bit of your phone is working properly. The tests between Phone Doctor Plus and Phone Check are relatively similar, but the Phone Doctor Plus UI provides a better overall experience. At least, it does visually. Under the hood, using my Samsung Galaxy S8 and an old OnePlus One for testing, all the results were similar. Phone Doctor Plus certainly makes it easy to test your device. The star ratings quickly illustrate any issues or alert you to something that’s about to turn into an issue. The battery health check is also handy, offering suggestions for the best ways to improve and recalibrate your battery. The two preceding apps find dead pixels, but don’t fix them afterward. If Phone Doctor Plus or Phone Check does show a dead pixel or two, you can move onto the Dead Pixels Test and Fix app. Dead Pixels Test and Fix attempts to repair partial sub-pixel defects, stuck sub-pixels, dead pixels, dark and bright dot defects, and phantom images. The process can take anywhere between a few minutes to over an hour to run. The developer advises that if you don’t see any improvement within a few hours, the app unfortunately won’t be able to fix your issue. Battery life and degradation are some of the most infuriating aspects of owning a mobile device. Your battery seems to be working fine one moment, then the next it crashes with 25 percent charge remaining. There’s a reason for that: batteries have a limited life, and the overwhelming majority of us don’t maintain those batteries efficiently. The AccuBattery app doesn’t magically fix your battery problems. If your battery is dead, no app can help it. However, AccuBattery does run through a list of specific battery health checks in an attempt to figure out where your battery is in its lifecycle. The app features useful information such as the current battery capacity versus the intended capacity (and thus, the level of wear). You’ll also learn how much wear your battery sustains with each charge, and how power each app uses, along with the overall discharge speed. 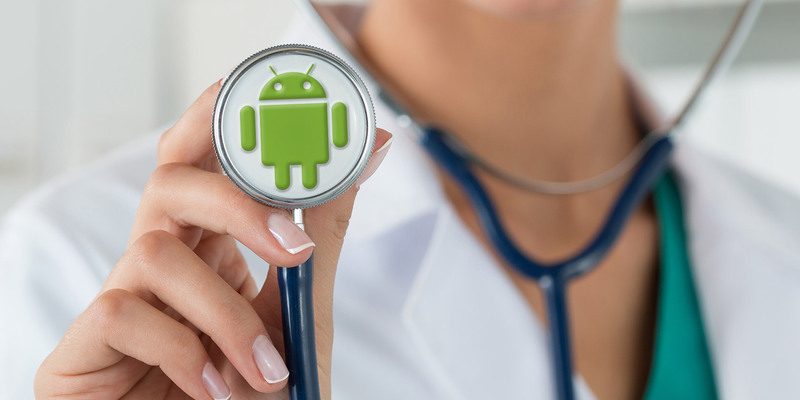 These apps represent some of the best free options for you to conduct a free Android health check. There are a substantial number of apps on the Play Store that claim to check, fix, update, and clean your Android device. The vast majority aren’t necessarily bad apps, but are clones of existing projects, offering little innovation or an expansive toolset. Unsure what to do after analyzing your Android issue? Check out common Android problems and how to solve them, or our guide to fixing Android boot problems.